On my Aug 28, 2013 blog I championed the value ‘RESPECT’ as the prominent ingredient of any and all good values. I argued that RESPECT encompasses in it contemporary ‘politically correct’ standards, such as diversity, tolerance, acceptance, but from a place of innocence and humility rather than that of arrogance. RESPECT, I opined and I stand by that assertion, is the “substance from which all good values emanate”. It dawned on me that I neglected in my enthusiasm to first identify and define the meaning of the words ‘GOOD’ and ‘VALUE’, which should have been a logical place to start. However, upon further reflection I realized that it would take a doctoral dissertation to properly define GOOD and for that matter articulate the essence of VALUE. So I’ll go back to RESPECT. Your comments are invited and welcome! Two children’s books with Good Values, written by teens! Mrs. Mojica’s enthralling account of the statue’s construction and history includes fascinating details about its origins, its purpose and significance, its architects and designers, and the physical and financial effort its building necessitated. Mrs. Mojica seamlessly interweaves information about prominent historical figures that were involved in making Lady Liberty’s part of the American story, among them Joseph Pulitzer and Emma Lazarus. Exquisite illustrations by Mr. Victor Ramon Mojica add yet another dimension to this beautiful creation, an esthetic element that renders this exceptional book a must have. 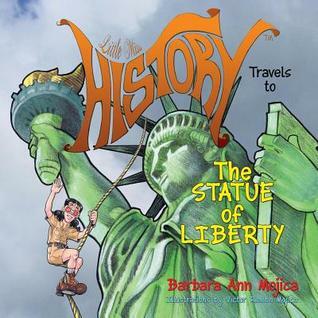 Get your copy of Little Miss History Travels to the Statue of Liberty today. Click Here! The first installment of this lovely series, Little Miss History Travels to Mount Rushmore is also highly recommended. Louey the Lazy Elephant is a charming book about a young elephant that lazes about and finds himself in a pickle. As he habitually did, Louey oversleeps even on moving day, only this time he wakes up to discover himself all alone; his family and the rest of the herd have moved on without him. To Louey’s credit, he does not panic. Rather, Louey immediately sets out in pursuit of his family and seeks the help of other animals along the way. In his quest to be reunited with his family Louey transforms! Acquire the Louey the Lazy Elephant and find out more about Louey and his eventful journey that compelled him to overcome his lazy ways. I cannot imagine a more heartwarming gift than the dedication of this adorable, well-written and beautifully illustrated book by author Janice Spina and illustrator John Spina to their beloved grandchildren. Fortunately, all children and grandchildren now have the opportunity to get their copy of this gem of a book. Highly recommended! One of the greatest gifts we can bestow upon our children is the love for reading. Aside from the developmental benefits derived from early exposure to the written word and the advantages kids who read and are read to enjoy later in life in their academic and professional pursuits, reading transports children to worlds beyond their limited life experience, alerts them of opportunities and choices, broadens their scope, and inspires them to dream big. The ability to read also enhances in kids their self-confidence and self-esteem. In her delightful book Because I can Read, author Pat Nicholson demonstrates to children with the aid of lovely rhymes and terrific illustrations the benefits and the possibilities unlocked by the ability to read. She begins her store “Because I can Read, I know that I am smart. I can learn about anything, and this is where I start:” I warmly recommend this book. In her ongoing effort to promote children’s books with Good Values Sarah Mazor of MazorBooks created a new group on FaceBook, called Children’s Books with Good Values. Sarah is inviting children’s books’ authors that celebrate good values and seek to enhance children’s intellectual growth, emotional health and physical well-being to promote their books to this new but growing group. MazorBooks is proud to announce the publication of When I Grow Up by Michali Mazor. Fifteen year old Michali Mazor just released her first Children’s Book and it is LIVE on AMAZON. Michali, a junior in high school, is planning to pursue degrees in English and Education. She loves kids and loves to write. A winning combination for a children’s author! Her ebook (only $0.99) is available on Amazon. Please encourage and support young talent! Reviews are welcome. Michali is the younger sister of published author, Ari Mazor, whose book Clothes Have Feelings Too! was released last month. The talented brother and sister team continue to write and plan to release more children’s books in the near future. Introducing the Hebrew Alphabet: Book of Rhymes for English Speaking Kids. Boca Raton, FL — The Hebrew Alphabet Book of Rhymes focuses on the 22 letters of the Hebrew Alphabet, presented in attractive illustrations and spelled out in English and in The Hebrew Alphabet Book of Rhymes focuses on the 22 letters of the Hebrew Alphabet, presented in attractive illustrations and spelled out in English and in Hebrew. In addition to the letters, 22 basic Hebrew words that are appropriate for young children are taught in a fun way. The words selected, one for every Hebrew letter, are written in Hebrew, transliterated and translated to English, and depicted with an attractive illustration. Each Hebrew word included in the book is incorporated into an English rhyme that will help kids and adults also learn foundational words in this beautiful language. The Hebrew Alphabet Book of Rhymes also provides an alphabet chart, a transliteration guide, and proper pronunciation help with ‘sounds like…’ examples. A bit about the history of Hebrew as well as fun facts about this beautiful language is also included. 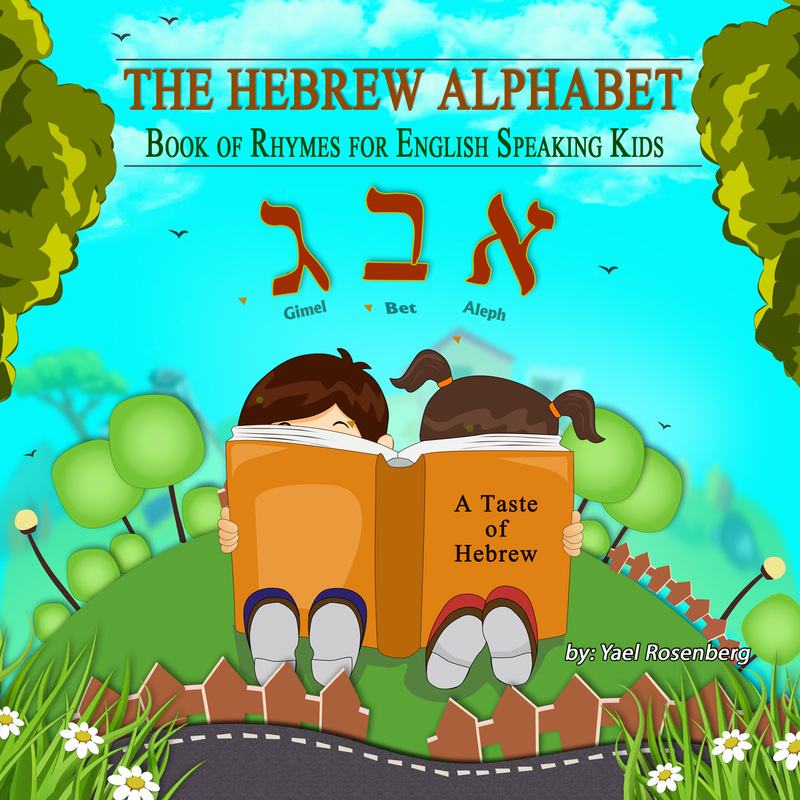 The Hebrew Alphabet: The Book of Rhymes for English Speaking Kids is available on Amazon.com in both digital ready to download format as well as in paperback.